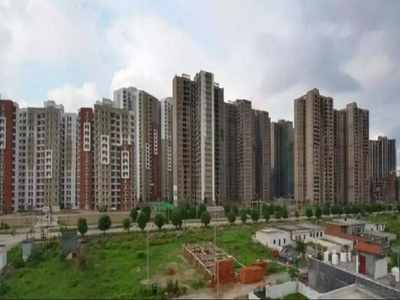 NOIDA: Nearly a month after the district administration sought details from local authorities on the properties and other assets of criminals booked under National Security Act, the administration is all set to attach these properties. On Saturday, the district magistrate sent a preliminary list containing 48 properties to the police, asking them to initiate proceedings to attach them. Talking to TOI, district magistrate BN Singh said the first list has been shared with the Noida police. “The first list of 48 properties and 26 vehicles registered in the names of gangsters being tried under NSA has been shared with the SSP, Gautum Budh Nagar. Eight bank accounts along with details of eight vehicles are also in the list,” Singh said. According to the DM, proceedings will be initiated soon to attach the properties and assets. “As and when more information from different zones come in, we will share that information,” he added. The list includes names like Titu, one of the two men who had allegedly shot dead a security officer of an electricity sub-station on April 21 after he refused to restore electricity in the middle of a storm. The alleged murder had sparked widespread protests by workers in the electricity department. The property identified as Titu’s is a plot in Basai village. Also in the list is Sanjay from Momnathal, who was arrested for illegal sand mining. Three of his properties, bought in 2014 and 2015, figure in the list. Avdesh Kumar Goel of Earth Iconic Infra also figures in the list with a property in Greater Noida which he bought in 2013. The company was in the news for cheating hundreds of homebuyers earlier this year. This apart, there are over 25 other names accounting for 48 properties that figure in the list sent to the SSP. In September this year, the administration had announced its decision to attach the properties of 566 gangsters and stop their financial transactions as part of a major crackdown on criminals. The action is supposed to be taken against 150 criminal gangs, including 566 persons who have been booked since May 1, 2017. Also included in the list are mafia men, builders involved in cheating, drug lords and cyber frauds, senior officials said. They are from all regions of the district including Noida and Greater Noida. Section 14 and 15 of the Uttar Pradesh Gangsters and Anti-Social Activities (Prevention) Act, 1986, enable the government to attach any “ill-gotten” property, both movable and immovable. The DM had written to all departments including local authorities (municipal), income tax, sales tax, sub-divisional magistrates, police station incharges, CDO and ARTO for relevant information. “We asked them to stop the financial transactions of these people and sought details within 15 days so that we can take further action against them,” Singh said. 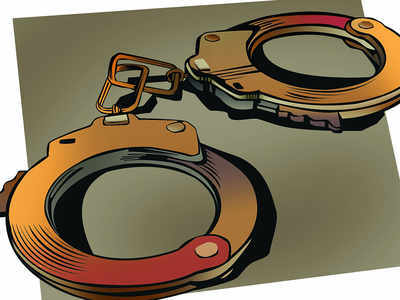 Realty firm's director arrested at IGI airport A director of real estate company Premia Group was arrested by the crime branch of Noida police soon after she flew into IGI airport from Canada late on Friday. NOIDA: A director of real estate company Premia Group was arrested by the crime branch of Noida police soon after she flew into IGI airport from Canadalate on Friday. Natasha Rajput, who had a lookout notice issued against her along with other directors of the company after four FIRs were lodged last year, arrived in India with her husband Indraveer Bohra. She got married to Bohra this April and had left India in July. Police had subsequently issued a lookout notice. The four FIRs name six people, including Natasha, and were registered on complaints by investors who alleged 3,000 people had been cheated. Among those who complained were those who booked flats and corporate offices. Two others accused - president (sales) Amit Somal and director Charanjeet Singh - have already been arrested. While Somal was arrested by the crime branch in August, Singh was arrested by Delhi Police last year. Among those absconding are the managing director. The FIR was registered at Sector 20 police station under sections 420 (cheating) and 406 (punishment for criminal breach of trust) of the IPC. The company could not deliver on its promise of flats and corporate spaces in five years, neither could it give refund, the buyers have alleged. 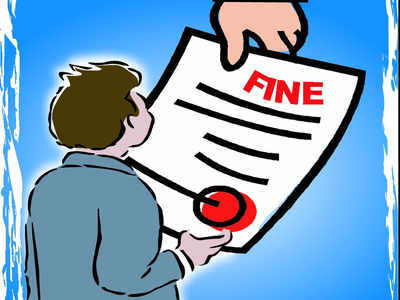 NOIDA: The Noida Authority on Sunday fined three builders for not adhering to guidelines laid down by the National Green Tribunal (NGT) and keeping construction material uncovered at various sites in Sector 63. Two builders were fined Rs 10,000 each and the third one Rs 5,000. A team of the Noida Authority’s health department received information that some people were violating NGT norms while constructing projects in the industrial area. “We conducted an inspection in Sector 63 on Sunday. We found construction material lying uncovered in J-40, which is being developed by a person named Manoj. Similar violations were found in E-145, which is being developed by Ram Kishore Garg. We also found uncovered construction material in F-468 in the same sector. This was developed by one DK Prentley,” said an official. Manoj and Garg were fined Rs 10,000 each while Prentley was fined Rs 5,000. The developers were warned of stricter action for subsequent violations, oficials said. The Noida Authority has directed all work circle officers to conduct inspections in their respective areas and ensure green norms are complied with, at a time the air quality has been hovering around the poor and very poor levels. Last year, NGT had issued guidelines directing developers to use sprinklers and create green air barriers around construction sites. Rajesh Kumar Singh, officer on special duty at the Authority, said they were taking regular measures to keep pollution levels in check in the city. “We sprinkle water on roads across all sectors daily. We have also advised developers to strictly follow the NGT guidelines at construction sites. Action will be taken against them if they violate rules,” he said. NBCC told to get NOC for construction of institute The UP Pollution Control Board has issued a notice to National Buildings Construction Corporation, the developer of Pt Deendayal Upadhyaya Institute of Archaeology in Greater Noida, asking it to produce an NOC from the ministry of environment, forests and climate change. NOIDA: The UP Pollution Control Board has issued a notice to National Buildings Construction Corporation, the developer of Pt Deendayal Upadhyaya Institute of Archaeology in Greater Noida, asking it to produce an NOC from the ministry of environment, forests and climate change. Regional UPPCB officials said they had conducted an inspection of the site and found the developer was following the construction norms. But the site in-charge could not produce an NOC from the environment ministry at the time of inspection. AK Tiwari, regional officer, UPPCB, said the department had received a complaint through IGRS about alleged violation of pollution norms at the site. Acting on the complaint, a team visited the site and found that the developer had covered the site with 15-feet boundary walls and tin sheds. Also, to check dust, water sprinkling was done frequently. Union home minister Rajnath Singh had laid the foundation for the institute’s building on October 28, 2016. The state-of-the-art building is proposed to house a conference hall with a capacity of 1,000 people, an archaeological museum, residential buildings, hostel facilities for both boys and girls and a cafeteria. The Rs300-crore project is likely to be completed by the end of this year. The Real Estate Regulatory Authority (Rera) of UP held a meeting with development authority officials of western UP in Noida on Wednesday and directed them to conduct a health audit of all unfinished projects. This exercise will be different from financial audit, and the study will focus on finding the stages at which the projects are stalled and the reasons behind the same. Even as the administration stopped construction at major project sites on Thursday, when the EPCA advisory came into effect, work continued at several smaller private projects in Noida and Greater Noida. In Ghaziabad too, a few violations were spotted during EPCA chairman Bhure Lal’s visit to Sahibabad industrial area. NEW DELHI: State-owned NBCC Thursday said it will submit a detailed project report (DPR) of Amrapali Group's 16 stalled projects to the Supreme Court next week and is mulling developing similar projects of other real estate firms. In September, the Supreme Court had appointed NBCC to develop stalled projects of the Amrapali Group following the company's proposal that it could complete all the stuck projects, comprising 46,575 flats, within 36 months at a construction cost of Rs 8,500 crore. Giving update on the Amrapali matter, NBCC's CMD Anoop Kumar Mittal said the company has issued tenders for 10-11 out of the 16 stalled projects. "In next one week, we will issue tenders for 5-6 projects. The DPR for all 16 projects will be submitted to the apex court in one week's time," Mittal told reporters here. He said the work on Amrapali projects would start after approval from the Supreme Court. Asked about funding, he said this would be decided by the apex court. Mittal also announced that NBCC would soon come up with a policy for development of new and stalled real estate projects in larger public interest. "We can act as project management consultant or co-developer or developer for real estate projects," he said, adding that projects could come up in joint venture. Mittal said NBCC in the next two months would be in a position to start construction works at Netaji Nagar and Sarojini Nagar redevelopment projects after High Court gave clearance to its revised plan. The company would take fresh approvals from the local bodies, if needed. Mittal said the company has bagged two projects in the national capital from Air India and expects to start work in the next 3-4 months. "By March, construction works in all 10 rail projects will start. We hope to complete these projects on time," he added. The Uttar Pradesh real estate regulatory authority (UP Rera) on Wednesday said it will rate builders after assessing their track record with reference to completing the projects on time. Currently, homebuyers have no data to check the antecedents of the builders and they fall prey to false promises made by dubious builders. “We have decided to start rating system from 1 to 5 stars, depending on the past performance of the builders. We will provide information about builder’s financial position and its failed projects to the prospective buyers. This will enable homebuyers to make a proper selection of the property,” said Balvinder Kumar, UP Rera member. There are 500 housing projects in Noida and Greater Noida against which homebuyers have filed complaints. According to Rera, there are over 3,000 complaints which are yet to be addressed by the authority, of which 80% are from Noida and Greater Noida. The real estate regulator is also in the process of hiring a private agency to monitor the projects and will seek updates where the builder has not been able to meet the deadline for the project completion. “As per Rera norms, a builder has to submit the progress report of the project, every quarter with Rera. Due to shortage of staff, physical verification of all such reports is not possible. Now, we are hiring a private agency which will check the housing projects to corroborate the quarterly reports filed by builders registered with us. This way, we will be able to monitor the projects in a proper manner,” said Kumar. The real estate authority has also directed its office to identify projects whose completion period as per records has been over and seek updates from the developers. As per Rera norms, a builder has to set aside 70% amount for construction work and deposit it in a separate escrow account. “We will monitor escrow accounts of the builders through the private agency and try to ensure that these funds are not diverted to other projects. Diversion of funds is the major cause of delay in the projects,” said Kumar. Kalpana Mishra, and bench 2 comprising Rera members Balvinder Kumar and Bhanu Pratap Singh met at Greater Noida Regional Office. Eleven cases were listed for bench 1 and 89 for bench 2. Waiting area has been set up for both benches. In 12 cases, we had postponed the date of hearing and informed the complainants about the status by SMS,” said SK Verma, deputy secretary, Rera. Due to piling up of cases, the two benches of UP Rera in Greater Noida have decided to function thrice a week instead of two hearings per week. The decision taken at the 195th board meeting, will need approval from the UP government before it comes into effect. 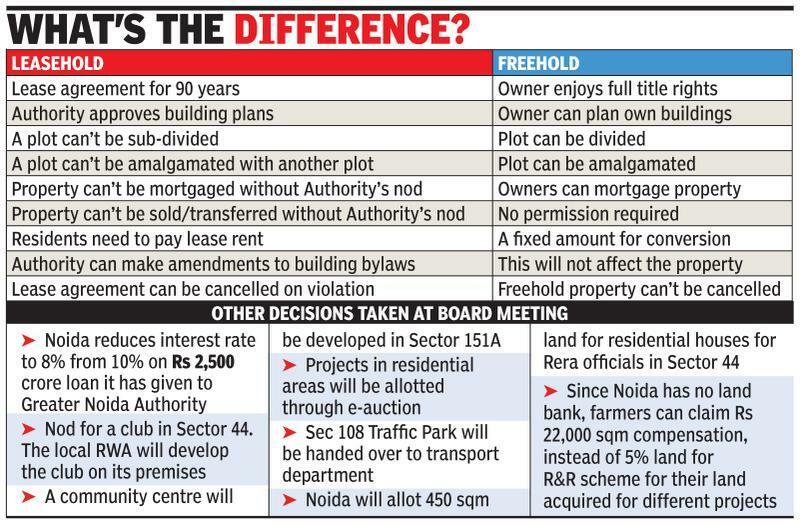 Once it does, the state  in this case, Noida Authority  will cease to be the lessor of all residential property in Noida. As a result, sale of plots, houses and flats can happen without a no-objection certificate from it. Noida was established in 1976 under the UP industrial Act and the Noida Authority held the title rights of all land under it. It acquired land from farmers and then made allotments in various categories like residential, industrial and commercial for a 90-year lease. Conversion to freehold means the change in title ownership, through a mutation, will be applicable to all residential properties, including plotted ones, builder floors and housing society flats. The decision, said realtors association Credai, will have a positive impact on the sluggish real estate market in Noida. But conversion charges are also likely to be applicable when one goes in for a mutation. Noidas officer on special duty Santosh Kumar said, In leasehold property, the Noida Authority is the owner. In freehold, residents will have ownership rights. This means the owner is free to use the property for any purpose, in accordance with local regulations. The sale and purchase of freehold property also does not require consent from the state, and hence, means less paperwork. Credais NCR president Pankaj Bajaj said, In freehold property, no permissions or transfer charges are payable while selling. Typically, other things remaining the same, a freehold property will sell for about 10-15% higher than a leasehold property. This is attributed to the fact that a freehold property is seen as encumbrance-free. Bajaj, however, cautioned that aspects such as freehold conversion charges and the kind of residual controls that Noida Authority keeps would also have an impact on the decision. The Noida Authority board also considered residents demand to allow sale of flats floor-wise in residential sectors but no decision was taken. Is this applicable for GN & YEW? 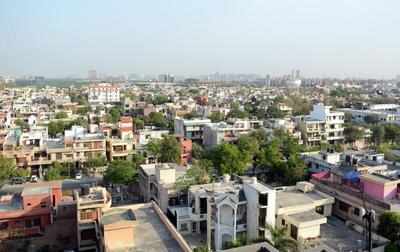 A day after the Noida Authority decided to send a proposal for conversion of all leasehold property in the city to freehold, officials said the modalities of conversion would be similar to that in Delhi Development Authority. In Delhi, the DDA offers online and offline process for conversion. The applicantis required to fill the form and attach his or her lease agreement and an affidavit. The applicant has to declare that no dues are pending. The DDA examines the application and executes the process. After this, the applicant has to visit the stamps and registration department to complete the formalities of registration for freehold property. The conversion from leasehold to freehold may take 45 days. A team of the Central Pollution Control Board (CPCB) slapped a fine of Rs 50,000 on the National Highways Authority of India (NHAI) on Friday for keeping construction material in the open along the Delhi-Meerut Expressway near Bamheta village in Ghaziabad. Fresh U-turn created to unclog Kisan Chowk Nearly a month after the traffic police closed Kisan Chowk for those travelling from Surajpur-Tilapta side towards NH-24, another diversion has been put in place for those going towards Bisrakh side from the national highway. This U-turn was suggested by cops after their previous experiments failed to reduce congestion at Kisan Chowk. NOIDA: Nearly a month after the traffic police closed Kisan Chowk for those travelling from Surajpur-Tilapta side towards NH-24, another diversion has been put in place for those going towards Bisrakh side from the national highway. This U-turn was suggested by cops after their previous experiments failed to reduce congestion at Kisan Chowk. Now, commuters travelling from NH-24 and Tigri roundabout will not be able to take a right turn from Kisan Chowk to travel towards Bisrakh and Greater NoidaWest directly. Instead, they will have to travel to the new U-turn created about 100 metres ahead of the Kisan Chowk to continue travelling towards their destinations. “Those travelling towards Greater Noida West and Noida will now travel till the U-turn constructed before Ek Murti roundabout,” said SP (traffic) Anil Jha. Jersey barriers were put in place on Thursday evening, catching commuters by surprise. Arjun Singh, a resident of Sector 123, said any diversion should be made only after due prior intimation to commuters. “In case, a diversion is being planned, commuters should be informed about the same beforehand. Otherwise, it leads to chaos,” he said. However, Sanjeev Dixit, who stays in Homes in Sector 121, said while traffic movement was relatively smooth after the driversion, “the tendency of commuters travelling on the wrong side to avoid the cuts needs to be checked by the police”. 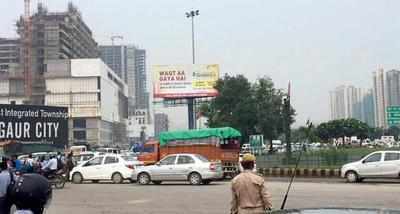 In early September, the traffic police had closed the direct movement of vehicles from Greater Noida West towards NH-24 by placing barriers on one part of the stretch. These commuters are being made to travel towards the Parthala roundabout and after taking a turn from there, they are continuing towards NH-24 and Surajpur. NEW DELHI: Realty firm Bayaweaver will invest around Rs 1,000 crore over the next four years to develop a commercial project in Noida, which will have retail space, hotel and service apartments, a top company official said. "We are coming up with a commercial project in Sector 129 on Noida Expressway comprising 1.9 million sq ft of built-up area and 1.3 million sq ft of saleable area," Singh told PTI. In August 2014, BOP India bought 4.67 acres of land parcel from Jaypee Groupfor 390 crore. The project 'Oh my God' would have 3.25 lakh sq ft of retail area, a 4-star hotel and 800 service/studio apartments, he said, adding that the name of the shopping mall has been kept 'X-Noida'. NOIDA: Shoppers flocking to the Sector 18 market prefer to park their vehicles on roads lining the shops despite the multi-level parking, which has a capacity to accommodate 3,000 cars, being ready. According to data sourced from agencies that handle car parking at the market, 20,000 cars had been parked along the roads in a week in the middle of October compared to only 8,000 at the MLP. The multi-level parking, however, witnesses a rush during the weekend, when shoppers flock to the market from across the city. Sources said most of those who prefer to park their vehicles on the surface are owners of shops and showrooms at the Sector 18 market. Sources said most businessmen preferred to park their vehicles near their shops as the MLP is at a little distance from the main market. Others who park their vehicles along the road are those who come to the market for a few minutes. They usually park their cars or bikes near the shops they intend to visit. This is despite the MLP having a reserved parking for corporate agencies, such as the Radisson Hotel across the street. The MLP witnesses a rush only during the weekend, when visitors prefer to spend long hours at the market. During peak business hours on Monday — between 1pm and 2pm — the surface parking has about 3,000 vehicles while the MLP has about 250. According to sources at DLF, the average time spent by a vehicle along the roads is about one and a half hours. Within the MLP, it is over two hours. Shopowners said the MLP has had little effect in solving parking woes. “We agree the MLP has taken a portion of the parking load off during the mall rush in weekends. But for us who come here every day and spend long hours, it hasn’t helped a little. There is a double row of parked vehicles still in the central part of the market and the congestion continues as usual,” said Sushil Kumar Jain, president of the Sector 18 Market Owners’ Association claimed. Another cause for snarls at the market area are motorcycles. Most people involved in buying, selling or supplying goods reach the stores on bikes. Most employees too access the market area on two-wheelers. According to the shopowners, more than 5,000 bikes come to Sector 18 daily while 4,000 cars get parked on the streets. The MLP remains empty and the streets full. Repeated calls to the Noida Authority on how to solve the parking woes in the market were not answered.